MoffettNathanson reiterates its sell rating for Twitter and lowers its price target, arguing that cost growth should accelerate. "For a business locked in competition with industry giants and under siege from regulators, reported operating expense growth has been amazingly low," Michael Nathanson says. Nathanson lowered his price target to $21 from $23, implying more than 30 percent downside from Friday's close over the next year. Twitter CEO Jack Dorsey is seated prior to testifying before a Senate Intelligence Committee hearing on foreign influence operations on social media platforms on Capitol Hill in Washington, September 5, 2018. Twitter's ability to keep costs low despite fierce competition and heightened regulatory scrutiny will not last, according to MoffettNathanson, which reiterated its sell rating Monday. For the first two quarters of 2018, Twitter has reported operating expense growth at an impressive 0 percent and 3 percent, respectively, analyst Michael Nathanson wrote. But a quick glance at the company's recent filings at the Securities and Exchange Commission appear to tell a different tale. "For a business locked in competition with industry giants and under siege from regulators, reported operating expense growth has been amazingly low," the analyst wrote. "After digging into the most recent 10-Qs, we would argue that true underlying cost growth has actually been materially higher in the range of 13 percent to 15 percent." And those costs aren't likely to retreat anytime soon, Nathanson added, pointing to Twitter's "dire need to improve platform safety" and invest in video content. But Twitter's decision to permanently ban certain users (such as conspiracy-slinger Alex Jones) have not only caused a political firestorm for the company, but driven up costs for CEO Jack Dorsey. Twitter did not immediately respond to CNBC's request for comment. 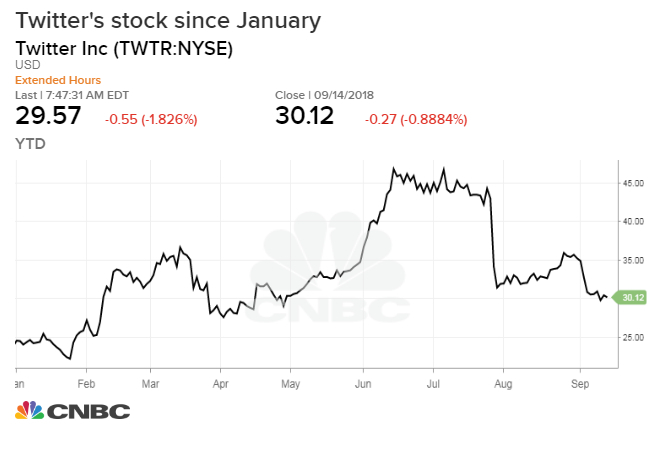 "Twitter's core non-stock based expense profile has actually been growing double digits in 2018, rather than the near zero rates reported," the analyst added. "However, ramifications for Twitter's top-line have been well covered as our revenue estimates are close to the Street's. Now, instead, we are most concerned about cost growth." Twitter's stock fell 4.1 percent Monday following the MoffettNathanson note. Shares are up 21.3 percent since January, but down 36 percent over the last three months.